Kinsale is an easy pattern to knit, but it takes a long time because the gauge is so tight. The pattern looks complex, but once you get it established, it’s pretty easy to knit it by “reading” your knitting. After a while, this sweater actually became pretty mindless knitting. I’ve decided that I like the chartreuse color. It’s bright, and different, and it’s grown on me. The finished Kinsale is a little bigger than I would have liked. 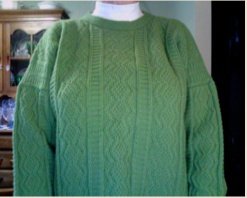 I wasn’t expecting the sweater to grow quite so much when washed. I won’t be using Knit Picks Merino Style again because of how much it grows when washed. It’s nice to work with and has very good stitch definition, but even with swatching, it’s very difficult to get the gauge right. and Norfolk, and I will definitely do others. 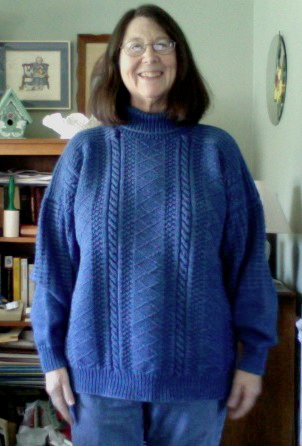 The sweaters are beautiful and Alice’s directions are very well written.